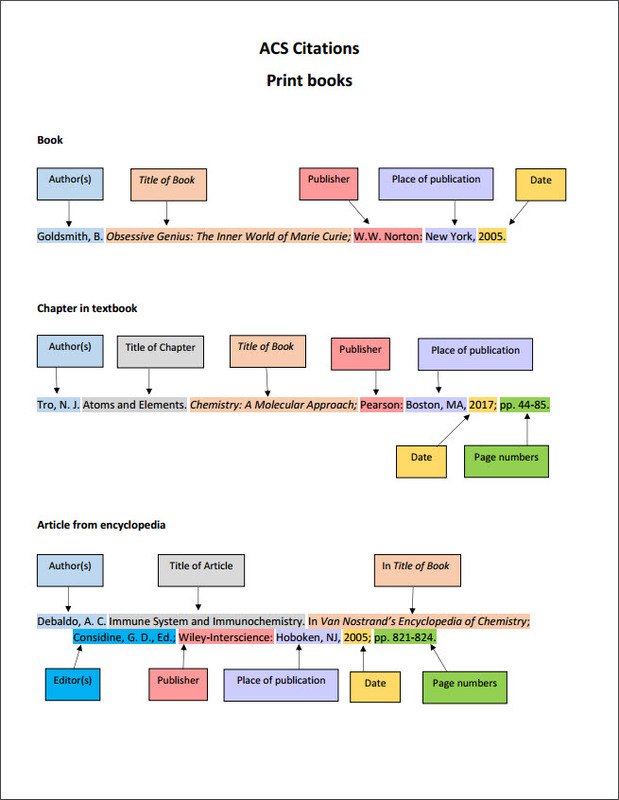 4-page handout with basic examples for citing the most common sources in ACS format. ACS guide from the University of Texas at Arlington. With ACS, you need to abbreviate the names of scientific journals. For example, the Journal of the American Chemical Society would be J. Am. Chem. Soc. 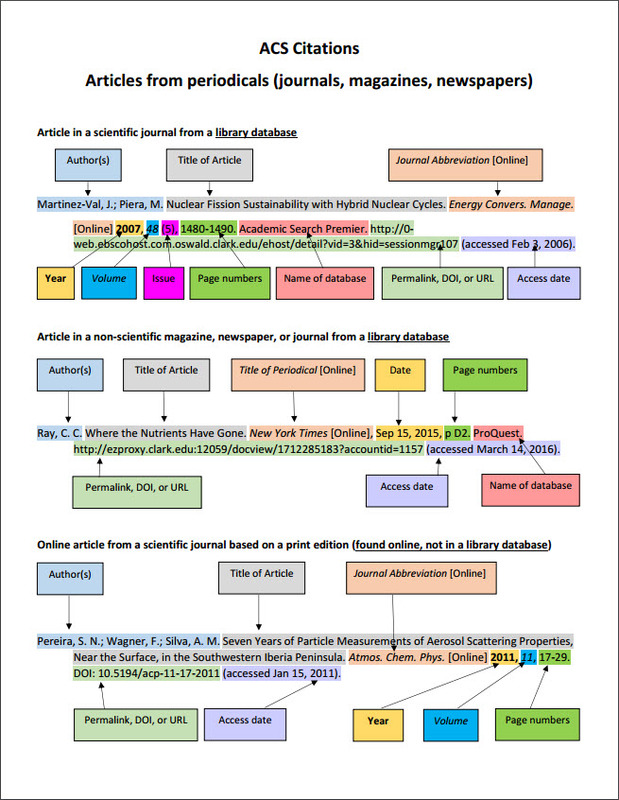 Use this free online tool to convert the full name of a scientific journal into an acronym, as required when citing sources using the ACS style guide. 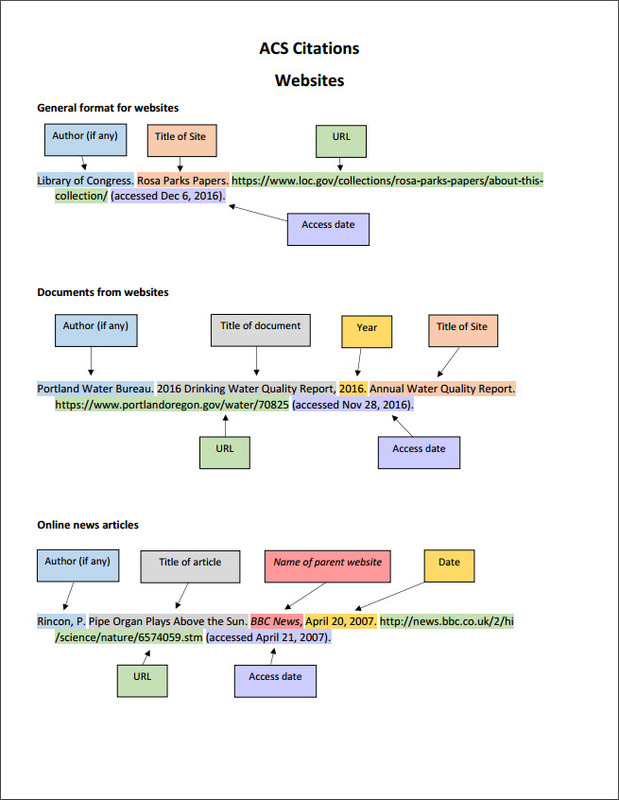 Include all author names in a reference citation. With multiple authors, separate the names from one another by semicolons. Always end the author field with a period. List the names in inverted form: surname first,then first initial, middle initial, and qualifiers (Jr., II). Put spaces between the elements and after punctuation, just as you would in a regular sentence. Remove hyperlinks. The URL should not be blue or underlined (in Word: right-click on the hyperlink --> remove hyperlink). For journals, the year should be in bold. For journals, volume numbers are in italics. For journals, if there is an issue number, include it in parentheses. For scientific journals, use the CASSI abbreviation for the journal name. If the journal is not in CASSI, use the full journal name and do NOT follow with punctuation. End the citation with a period. Keep visiting this box for updates! Question: There's no date on an article from the U.S. Department of Energy website. How to do cite it? 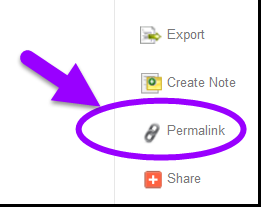 Question: Do I use a permalink or the URL from the address bar? Answer: For the Chemistry 142 annotated bibliography, when using an article from one of the library's databases, use the permalink for the article rather than the URL from the browser's address bar. Question: The URL or permalink is very long, and it causes a big gap of white space at the end of the line. Should I break it up? Answer: No. For the Chemistry 142 annotated bibliography assignment, don't worry about the white space; let the URL or permalink wrap naturally. Question: Do I include the article title? Answer: Yes. Although the ACS Style Guide says journal titles are optional information, it also says they can be "desirable to highlight the contents." 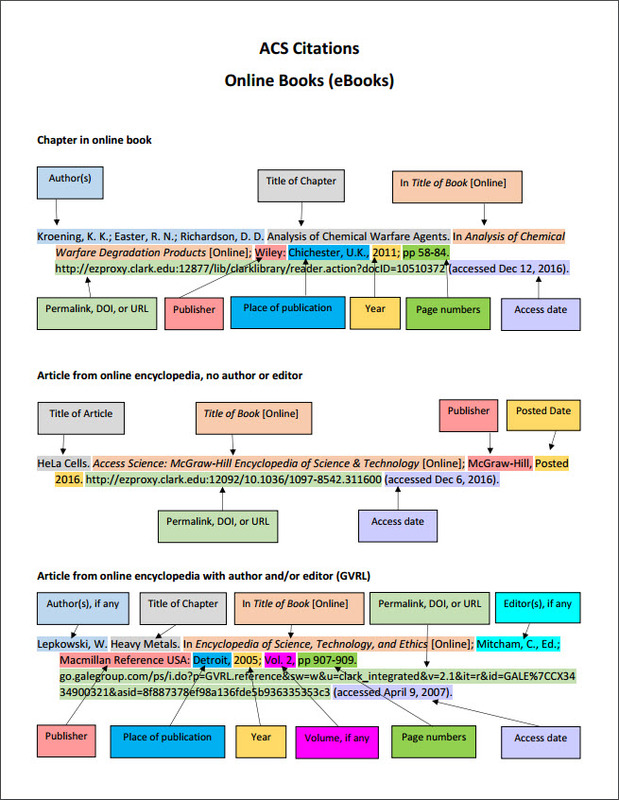 For CHEM 142, including the article title will make it easier to share annotated bibliographies with classmates. Question: Do I use title case or sentence case for the article title? Question: Should I use a URL or a DOI? Answer: If there is no permalink, use the DOI if one is available. If there is no DOI, use the URL from the browser. Question: What format do I use for the letters DOI? Is it DOI: or doi:? Question: How do I abbreviate a hyphenated first name, like Jane-Francis Smith? Answer: Keep the hyphen. Jane-Francis Smith becomes: Smith, J.-F. Question: What if a journal title is abbreviated, but it's not a CASSI abbreviation? Answer: If it's not a CASSI abbreviation, track down the full journal name and use that. Question: How do I treat names with participles, like Michael van der Putten? Answer: We cannot find a rule in ACS, so we are following this format: Michael van der Putten would be: van der Putten, Michael, alphabetized under "V". Question: If the journal title is not abbreviated, should I put a period or a comma at the end of the journal title? Answer: No. For both scientific and non-scientific journals, do not put either a period or a comma at the end of a non-abbreviated journal title.